Book a private jet or helicopter and fly to Toronto using our private jet charter service. Toronto is the capital of the province of Ontario, and a major business destination along Lake Ontario’s northwestern shore. Chartering a private flight allows you to bypass commercial air traffic by taking advantage of private and general aviation terminals. Clients using our Toronto jet charter service can choose to arrive at a variety of regional airports, allowing business and leisure travelers to land closer to their destination. Air Charter Advisors was established to offer the highest standards in executive and leisure travel, and our team offers on-demand private air charter services in Toronto. Our team has access to thousands of private turbo-props, jets and helicopters from around the world, all certified for charter flights to Toronto. We’re confident we will arrange the ideal aircraft at the right cost, whether you’re flying internationally or domestically. Air Charter Advisors is Wyvern-certified, and all of the private aircraft we use for jet charter flights to Toronto are operated by FAR Part 135 (or foreign equivalent) air carriers. Enjoy the convenience and peace of mind you get from working with a charter broker you can trust, and our Toronto Air Charter Advisors will become your local and global solution for luxury air travel, aircraft acquisition and private jet management. 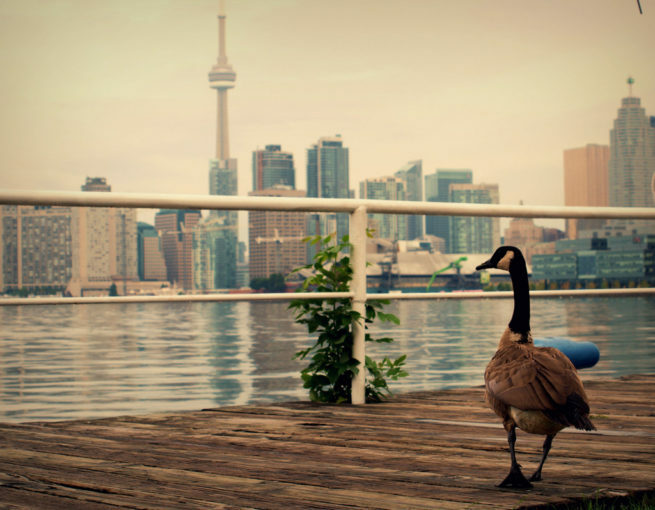 Call or request a quote for private charter flights to Toronto, Canada. We’re here to assist you with all of your private aviation needs, from booking your private jet and creating its flight itinerary to arranging gourmet in-flight catering, luxury ground transportation, helicopter lifts and any other requests you may have – consider our Toronto Jet Charter Service your one-stop shop for all things private aviation in Ontario, Canada. Toronto, the most populous city in Canada and one of the most multicultural and cosmopolitan cities around the world, has established itself as a global city and an is an international center for business, finance, arts, and culture. Hiring a private jet into (YYZ) Toronto Pearson International Airport is the most convenient and comfortable way to experience the city’s unique, diverse atmosphere. 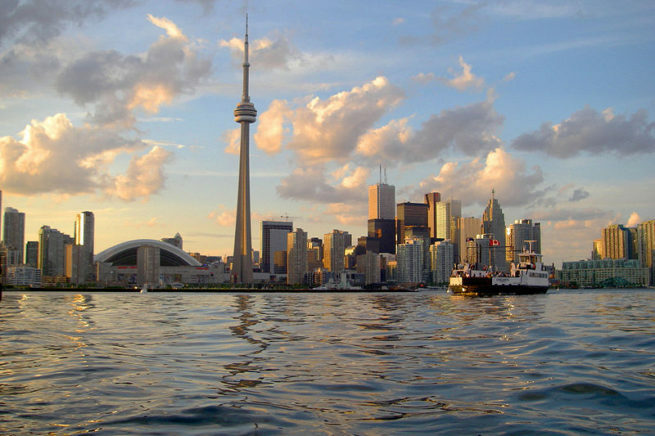 The Greater Toronto Area (GTA) is home to more than 6 million people, and the City of Toronto lies in the heart of the GTA along the northwestern shore of Lake Ontario. It’s often referred to as “The New York of Canada”, given its massive population – about one-quarter of all Canadians live in the Golden Horseshoe, an abundant array of skyscrapers, and the fact that it has been a popular haven for immigrants throughout the years. Coincidentally, it was referred to as York after European traders made it there in the late 1700’s, but later reverted to its original name in 1834. By the end of the 19th century, Toronto would become the economic and cultural focal point of Canada. The UN lists it as second only to Miami in terms of foreign-born residents, and the city’s liberal policies and its strong economy shaped it into one of the most diverse cities in the world. Although the city dropped the name York in the 19th century, it uses it for a few of the districts that make up the metropolitan area. These were all former cities that, in 1998, combined to form the City of Toronto we see today. After your private jet arrives in Toronto, you’ll hear up to 16 different languages spoken — if you don’t hear yours, the Toronto Transit Commission offers 70 languages on its help line. You’ll even find large stores downtown proudly advertising their services in a dozen languages, however, English remains as the city’s lingua franca. Toronto is the epicenter for music, theater, motion picture production, and television production in Canada, and home to the headquarters of the nation’s major broadcasting networks and media outlets. More than 25 million tourists visit the capital of Ontario annually, attracting both commercial and private flight from around the world to it’s cultural institutions, including numerous museums and galleries, festivals and public events, entertainment districts, national historic sites, and sporting events. 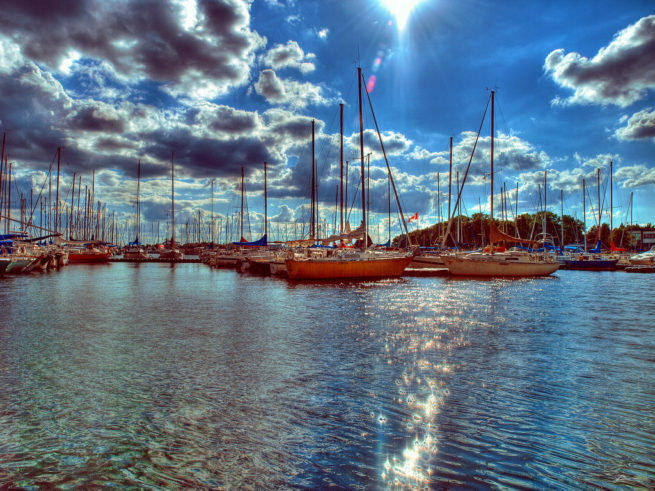 Check out our list of events and attractions to enjoy after your charter flight. Take advantage of the local attractions and daily activities during your next visit – make sure to research all the local options before booking your private charter flight to Toronto. Hire a business jet and fly private to Toronto, an international center for business and finance and often considered the financial capital of Canada. Many businesses operate on both sides of the border, making executive charter flights between Toronto and New York City a commonly requested “shuttle route” for business jet travelers. The city holds a high concentration of banks and brokerage firms along the Financial District’s Bay Street, and the Toronto Stock Exchange (TSX) is the world’s seventh-largest stock exchange by market capitalization. 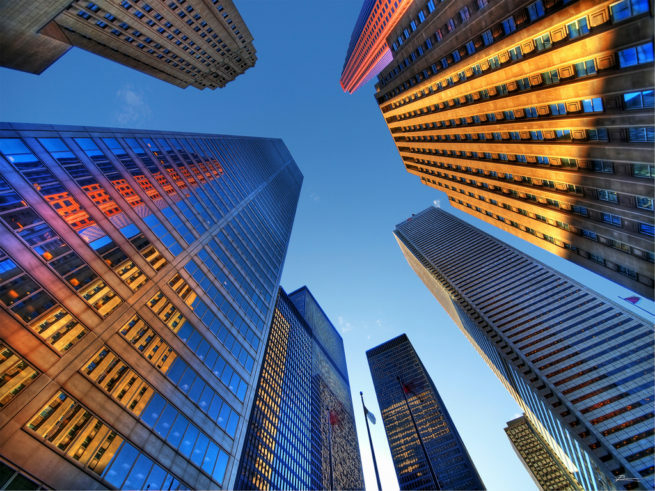 Canada’s five largest financial institutions, collectively known as the Big Five, all have offices located in the city. Although the local economy is driven by the industries of finance, media, and private aviation, nearby production of motor vehicles, iron, steel, food, machinery, chemicals and paper keep the trains rolling between here and Quebec. Efficient light jets such as Embraer Phenom 100s and Cessna Citations are ideal for departures from the areas smaller airports, and typically start at around $2,500 per hour. 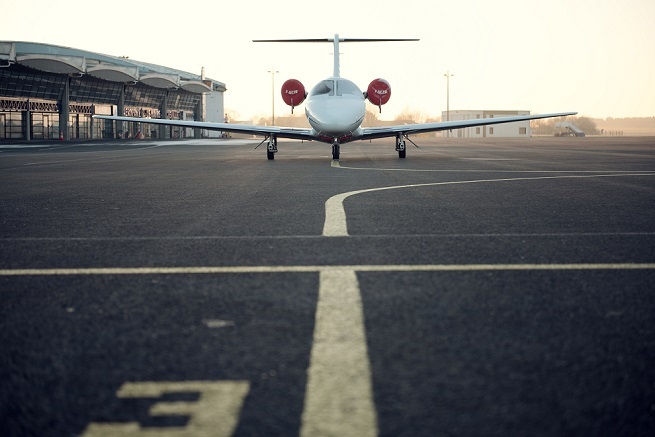 When departing from these local airports, private jets can reach a variety of major cities in under 2 hours, including Boston, Chicago, New York City, Philadelphia and Washington D.C. Long-range jets such as a Challenger 604 and Gulfstream V are the perfect solution to fly corporate teams overseas, reaching destinations such as London, Paris and Madrid in around 7 hours and 30 minutes. Rates for larger, long-range jets can vary between $6,500 – $9,000 hour, based on routing, scheduling and other factors. It’s important to note that because of the limited runways size of many local airports, larger aircraft such as mid-size jets and long-range jets must arrive/depart out of the (YYZ) Toronto Pearson International Airport. If you have a private or corporate aircraft that has a mechanical issue, or you need to arrange simultaneous trips for your business executives, we can arrange a supplemental lift to Ontario in as little as 4 to 6 hours. Our Toronto Air Charter team offers unlimited quotes with zero obligations – if you’re a fractional owner or a jet card member, call us before reserving hours and compare us to your current plan! As the capital of Ontario and Canada’s financial and cultural leader, private charter flyers will have many luxury four and five star hotel options to choose from — after all, The Four Seasons, one of the leading luxury hotels around the world and the preferred hotel for many of our jet charter clients, is headquartered here. The 55-floor Four Seasons features a spectacular design soaring high into the sky above the heart of Yorkville, downtown’s most glamorous shopping and restaurant neighborhood. It’s the first luxury hotel in Canada to receive both the AAA Five Diamond award and Forbes Travel Guide Five-Star ratings. ACA private charter flights gives clients access to private planes based at Toronto-area airports, and all across Canada and the United States. This allows us to locate the perfect aircraft for every flight we arrange, including empty leg charter flights, one-way routes, and round trip jet charter flights to Tornoto. We review third-party audits to make sure the planes and pilots we arrange comply with our standards, and we offer competitive rates and zero-commitment quotes on all your trips whether you’re flying domestically or into the US. Our Toronto Air Charter brokers utilizes the following private jet airports to arrange air charter service to/from Toronto, Canada and neighboring areas. Lester B. Pearson International Airport (IATA: YYZ, ICAO: CYYZ), often shortened to Toronto Pearson, Pearson Airport, or simply Pearson, is the main gateway to the city, and the largest and busiest airport in all of Canada. Pearson Airport is located just 30 minutes from the city center, and named after Lester B. Pearson, the Toronto-born Nobel prize winner and former Prime Minister. (YYZ) Toronto Lester Pearson International features its main 11,120-foot concrete/asphalt runway, together with 4 asphalt runways all more or less 10,000-feet in length, to accommodate private business jets of all sizes, all while serving as the main hub for Air Canada. Pearson is also the leading airport for cargo in Canada, handling nearly half of the country’s total air cargo traffic. The airport utilizes two active terminals, Terminals 1 and 3 — measuring over 6 million square feet in floor space, Terminal 1 is among the largest buildings in the world. It is also home to the standard customs and immigration facilities for our international air charter passengers. The north end of the airport is home to numerous hangars for private jets and charter aircraft, along with VIP facilities and maintenance services for private aircraft. Charter a private jet and arrive in style using our private air charter service. Air Charter Advisors offers clients a wide variety sleek and efficient business aircraft. Request a Quote or give us a call at 1-888-987-5387 to speak with one of our Private Jet Charter Toronto agents for your next luxury vacation, business trip, or special event. We have years of experience working with a wide range of clientele, providing exceptional service to heads of state, celebrities, and top business executives. Our Toronto jet charter brokers can arrange the perfect flight for your needs with our direct access to thousands of luxury private jets and aircraft.